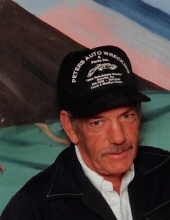 Walter Peters was born December 17, 1941 in Jackson County and departed this life Wednesday, November 21, 2018 at the St. Joseph East Hospital in Lexington, being 76 years of age. He was the son of the late Dennis & Elizabeth (Cunnigan) Peters. Walter is survived by three sons, James Peters and John Peters both of Laurel County and Jordan Tyler Peters of Tyner. He is also survived by a brother Frank Peters and his wife Madilyn and two sisters, Julie Pearl Peters and Dora Hacker all of Annville. In addition to his parents, Walter was also preceded in death by a daughter, Loretta McWhorter; brother, Danny Peters and three sisters, Barbara Jo Dunn, Nellie Dunn and Mary Baker. Walter was a member of the Millville Baptist Church in Millville, OH. "Email Address" would like to share the life celebration of Walter Peters. Click on the "link" to go to share a favorite memory or leave a condolence message for the family.